Mister Cartoon is world renowned for his detail, precision, and artistry with his main medium of tattooing, as well his car building, and iconic status in low riding culture. A mutual friend introduced Roland to Mister Cartoon for an extensive arm piece he was planning on getting done. After spending the better part of the night bullshitting about cars, bikes, art and of course tattoo’s they decided they wanted to work together on a project hence, MISTER CARTOON’S bike. Roland decided Toon needed an RSD vintage bike to ride so they decided to split the workload. 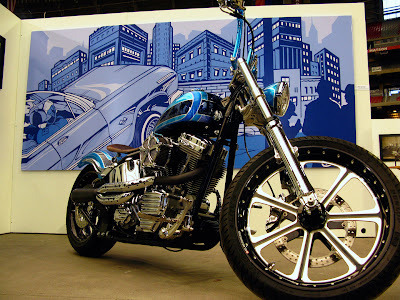 Roland did all the Fab work on the 2006 Harley Davidson softail while Toon did all the paint work. Neither gave an inch when it came to the details. As you can see, the collaboration of these two artists is mind blowing. “So with this project over and the IMS shows coming up it was an easy decision to ask Toon to participate,” stated Roland. Born and raised in Los Angeles, Mister Cartoon was introduced to design through his rudimentary career as a graffiti artist in the 80′s. He has since found his calling in hip-hop culture through the creation of tattoo art, magazines, album covers, backdrops for music videos and TV shows, and the trunks of lowriders. His style of art and fine line tattooing was popularized on the street in the 70′s. U.S. magazines that have featured Cartoon’s work include Rolling Stone, Details, Detour, Vibe, XXL, Hustler, Source, V America, Lowrider, Rap, Pages, Glue and Tattoo, and FHM. As well as Japanese magazines like Lowrider, Fine, Burst, H Magazine, Tokion; and the UK magazines Loaded and FHM. Cartoon’s has done album covers, logos, and or advertising material for Snoop Dogg, D12, Easy E, Clipse, Cypress Hill, Shady Records, Stussy, Supreme, Tribal, Streetwear, Black Flys, X-Large, and Joker Brand Clothing. His intricate art has been inscribed on the bodies of Roland Sands, Eminem, 50 Cent, Dr. Dre, Lloyd Banks, Mobb Deep, Cypress Hill, Method Man, Beyonce, Fat Joe, and Kayne West. He has been contracted to build custom cars for Larry Flint, Oscar De La Hoya, Eminem, Fabolous, and Scion (a division of Toyota), just to name a few.